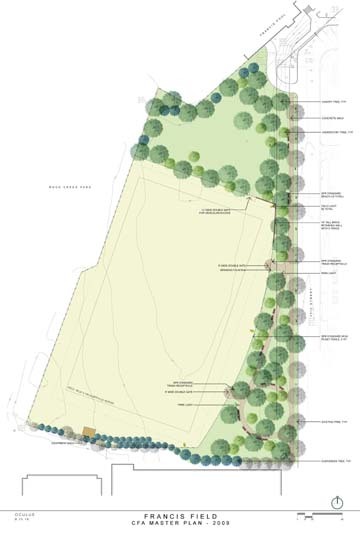 There is a master landscape plan for Francis Field that was developed over a two-year period from 2007 to 2009. It remains in effect, and is the federal government's plan for the design and use of the field until at least 2019, and perhaps as long as 2024. The existence of the plan reflects the field's ownership—as a part of Rock Creek Park, a national park—and the jurisdiction of the U.S. Commission of Fine Arts (CFA), which was initially questioned. The CFA is the federal agency charged with advising the President, Congress, and the federal and District of Columbia governments on matters of design and aesthetics. The plan approved by the CFA in September 2009 is shown at right. Although the field has undergone some changes since then, the plan has not been revised or updated. Friends of Francis Field (FFF) the District of Columbia Department of Parks and Recreation (DPR), and the National Park Service (NPS) are currently discussing a revision of the plan for submission to CFA to reflect the changes. The development of the existing plan began in 2007, when the newly reorganized FFF became a party in the zoning case for the conversion of office buildings on 25th Street NW into what is now the residential building known as WestEnd25. 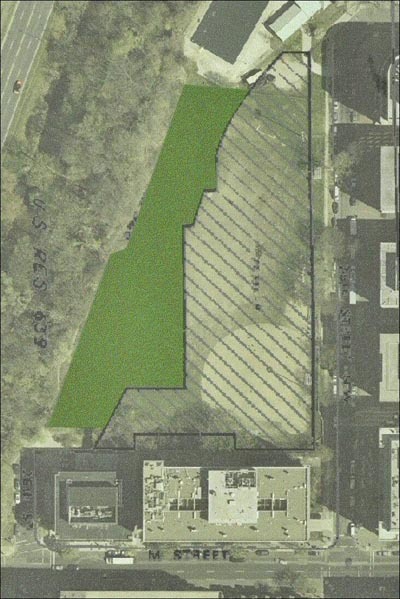 The Zoning Commission's eventual order, issued in July 2007, directed the developer to "prepare a landscape plan for Francis Field that includes the addition of trees, park lighting, furniture, trash receptacles, and a drinking fountain." 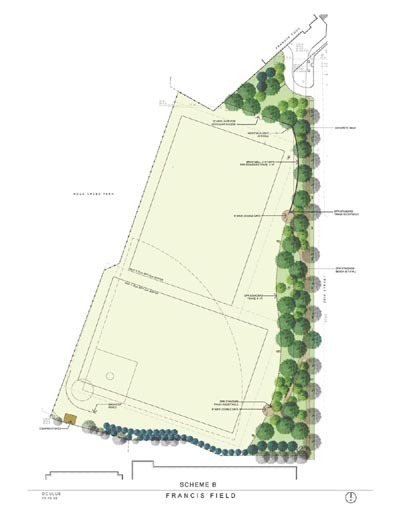 Early versions of the plan, under the direction of DPR, concentrated on providing maximum use of the field by the Stoddert Soccer organization, which was lobbying the DPR Director Clark E. Ray, to make the field essentially a soccer venue with artificial turf. Three "stakeholder" meetings were held at DPR headquarters in the spring and summer of 2008 with Stoddert Soccer and FFF among the stakeholders. 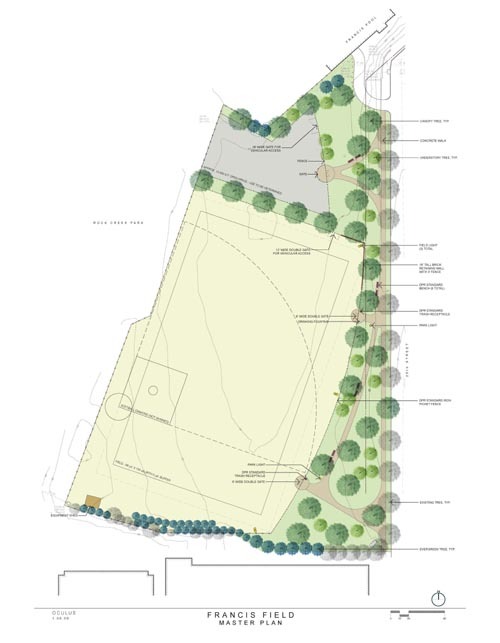 At a public meeting at the West End Library on October 11, 2008, two designs were shown to the community, both maximizing the area devoted to soccer fields, and providing little space for passive or non-athletic recreation. Plan B, shown at left, had two 50 x 70 yard soccer fields that could also be combined into one large field. This plan was heavily supported by Stoddert Soccer during the seven-day comment period that followed the meeting. At the public meeting, Bridget Stesney, a DPR representative, stated that neither plan was required to be reviewed by the CFA. That was also Director Ray's position. In answer to a question, Stesney told the 60 community members who were present that DPR's lawyers agreed with Ray's position that the CFA had no role in the approval process. Next, on December 17, 2008, the plans were presented to the Foggy Bottom and West End Advisory Neighborhood Commission (ANC-2A) which unanimously supported a single, multi-purpose field. ANC-2A added in the language of its resolution that no "field lights" or "stadium-style lighting" be included in any plan. FFF did not agree with DPR's stated position that the CFA had no jurisdiction in the review of the landscape architectural plan for Francis Field. Research into the 1910 enabling legislation and subsequent executive orders clearly showed how the Congress and two U.S. Presidents had expanded the CFA's duties of advising on matters of design and aesthetics. In 1921, President Warren Harding extended those matters to the design of the nation's coins, as well as statues, monuments, fountains, and "parks and public buildings constructed by executive departments or the District of Columbia." That order has never been rescinded or changed. Congress also widened the CFA's jurisdiction in 1930 with the Shipstead-Luce Act, which included private construction visible from important federal areas, including Rock Creek Park. In a letter of November 26, 2008, to FFF, the secretary of the CFA settled the Francis Field matter, stating: "... the federally-owned and District-operated Francis Field park and facilities are subject to this jurisdiction." DPR was also informed of the CFA's authority, and submitted the plan shown at left at the January 22, 2009, meeting of the full commission. The design shows a greater area for passive recreation along the 25th Street side. The grey area at the north end was intended to be a dog park, which was requested by residents in comments made at and after the West End Library meeting. In its written report DPR stated: "DPR has developed a master plan that will guide the use of Francis Field for the next 10-15 years. The master plan will be implemented in phases as Agency resources become available." While the CFA approved the Francis Field plan in concept, it recommended several changes that it wanted to see in a new submission. These included that "more attention be given to the design ... as a neighborhood park" after "consultation with affected parties such as the National Park Service and the local community." This recommendation, and CFA's contact with NPS revealed that DPR had been planning the Francis Field changes under the erroneous believe that DPR owned the entire field. "The singular and most important issue regarding the proposed master plan is that DPR is considering improvements on National Park Service property. It appears that they did not do a thorough land record search." NPS provided the graphic shown at left, showing the division of the field. The solid green section is the NPS "buffer area" for Rock Creek Park. The shades section was ceded to District of Columbia management in 1972, when the District achieved "home rule" government. Although probably not because of this error, DPR Director Ray was fired suddenly by Mayor Adrian Fenty on Sunday, April 19, 2009, and Ximena Hartsock was announced the next day as his replacement. A revised submission of the Francis Field plan was not made to CFA until September 3, 2009. What were called "encroachments on NPS property" were removed. One of these was the dog park, as dogs off-leash are not permitted in Rock Creek Park. Superintendent Coleman also found the floodlights that DPR had refused to remove, "inappropriate" and requested that "DPR identify funding for the removal of the existing lights" in the current fiscal year. In February 2010, the first steps in the implementation of the Francis Field improvements was begun. See separate article, the Zoning Case, on this website. The stadium lights, which were erected during the mayoral administration of Marion Barry in 1990, with no review by the CFA, were removed from Francis Field on June 19, 2010. Two developments announced in the spring and summer of 2015 created changes in the field. One was the construction of an official dog park in the north end of the field. The other was the announcement of the conversion of 2501 M Street--the building at the south end of the field--from mixed use to entirely residential. Plans for both of these developments were presented at the July 15, 2015, meeting of ANC-2A. The dog park was opened in November 2015. Demolition at 2501 M Street began in March 2016, where a portion of the field was occupied by permit. At its annual Membership Meeting of April 28, 2016, FFF showed photographs of the field's condition a few days earlier. As usual, the central playing field was largely bare dirt. The dog park had been constructed with no shade or landscaping. 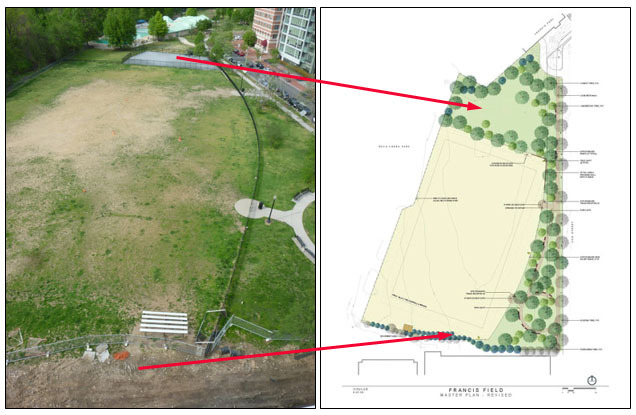 Trees and shrubbery had been removed at the south end of the field where the construction permit had been issued. While the Master Plan showed many trees, few actually existed on the field. FFF agreed that the Master Plan not only needed to be updated to show the existence of the dog park, but it also needed to be implemented--with grass in the central field, trees on the periphery, shade and landscaping for the new dog park. A continuation of this article will show the progress FFF is making in updating the Master Plan, and implementing it with well designed and selected landscape elements. 01. District of Columbia Zoning Commission, ZC Order No. 06-35, July 9, 2007, p.8. This is the order for a Planned Unit Development allowing the alteration of three office buildings at 1227-1231 25th Street NW, commonly referred to as the BNA buildings. PDF format. See pages 15 and 16 for Francis Field improvements ordered. 02. DC Stoddert Soccer, "Minutes of the Board of Directors," January 9, 2008, Item IV, B, p. 3. Also, Jessica Gould, "Francis Options Inspire New Fracas," The Foggy Bottom Current, Vol. 3, No. 47 (November 12, 2008), p. 1. 03. Warren G. Harding, Executive Order 3524, July 28, 1921. See Sue A. Kohler, The Commission of Fine Arts: A Brief History, 1910-1995, (Washington, DC: 1996), p. 243. 04. Thomas E. Luebke, Secretary, Commission of Fine Arts, to Gary Griffith, Secretary, Friends of Francis Field, November 26, 2008. 05. District of Columbia Department of Parks and Recreation, Francis Field: Park Improvements, January 8, 2009. PDF format. 06. Thomas E. Luebke, Secretary, Commission of Fine Arts, to Clark E. Ray, Director, DC Department of Parks and Recreation, January 29, 2009. Copy on CFA website. 07. Adrienne A. Coleman, Superintendent, Rock Creek Park, to Thomas E. Luebke, Commission of Fine Arts, February 15, 2009. 08. Adrienne A. Coleman, Superintendent, Rock Creek Park, to Thomas E. Luebke, Commission of Fine Arts, July 20, 2009.